Okay, the gaming connection? Slim at best and pretty much stops at the title. But hey, yesterday was the inauguration. If you're cool with all that, read on. 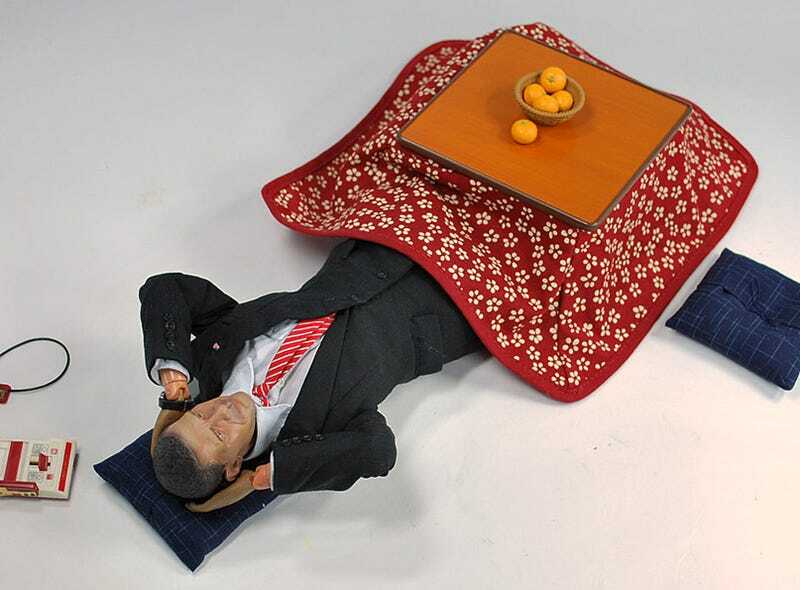 A 1/6 scale version of the new President is relaxing under a kotatsu. There are mikans and a nearby Famicom — not a Wii. But really, consider this to be an excuse to post pictures of Barack Obama doll wielding katanas, automatic weapons and fighting Darth Vader. The figure is from Japan's DiD Corp. and and will set you back US$59.99. Katanas, light saber, Darth Vader, machine guns and Famicom not included. Thanks Yokai Attack author Matt Alt for the tip!